Yesterday, AutoBlog brought us news that Tesla is facing a direct sales battle in Indiana that's backed by General Motors. In Indiana "a bill that was "authored and pushed by General Motors," (according to Tesla) is making its way through the state legislature," according to the online magazine. GM supports HB 1254. GM believes that all industry participants should operate under the same rules and requirements on fundamental issues that govern how we sell, service and market our products. A benefit of a nationwide network of thousands of dealerships is that General Motors customers never have to worry about driving to another state to buy, service or support their vehicles. Tesla's insistence on special rules could result in multiple manufacturers competing with similarly capable vehicles and similar price points, yet operating under a different set of rules. Tesla could open a franchised dealership with an independent operator in Indiana today, but instead they insist that the State must first provide them with unique rules and special exceptions to suit their own business interests. 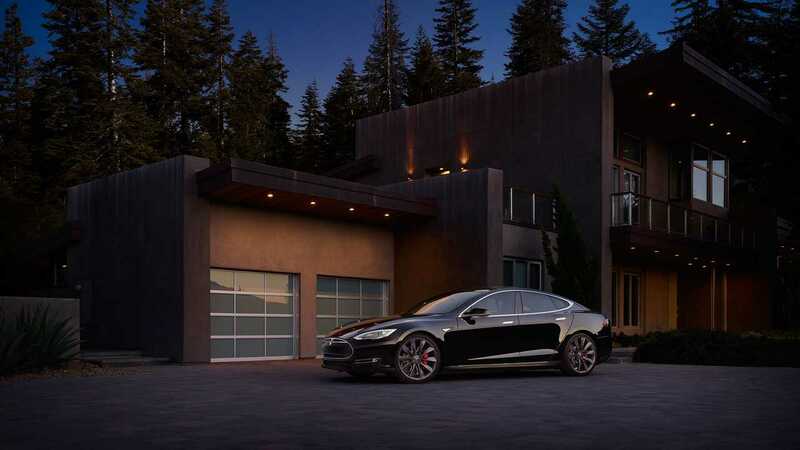 In fact, Tesla was willing to agree to a dealer model in Virginia. The Indiana legislature shouldn't create a special exemption for them here. 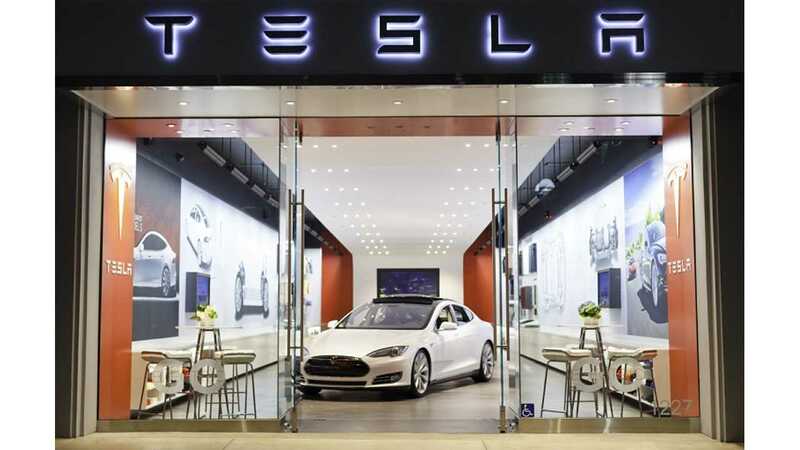 A state Senate committee on Thursday effectively tabled a controversial proposal to prevent Tesla Motors Inc. from selling cars in Indiana under its current business model. The Senate Commerce and Technology Committee voted to send House Bill 1254 to a summer study committee. 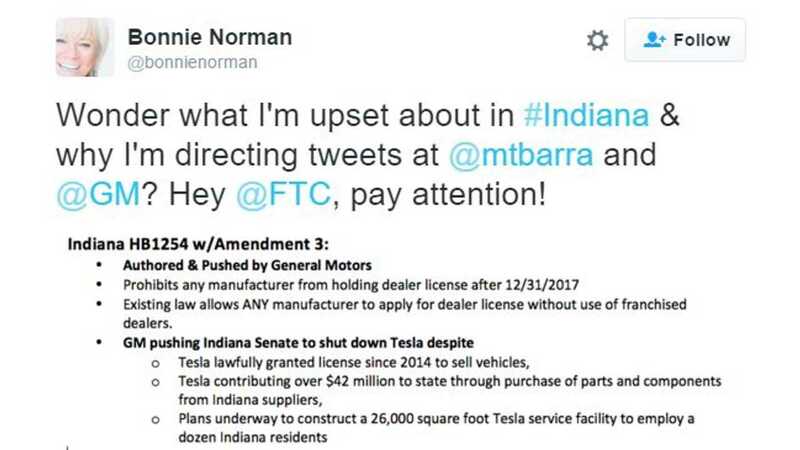 Tesla has been able to sell in Indiana, but this new bill, if passed, would cease Tesla's ability to sell there after July 1, 2016 (the date when Tesla's current license would expire). "All dealer licenses issued to a manufacturer under this chapter expire thirty (30) months after the date on which the first dealer license is issued to the manufacturer under this chapter. A dealer license issued to a manufacturer under this chapter may not be renewed." We need your help. Yesterday (2/18), the Indiana Senate Committee on Commerce & Technology held a hearing on a bill that would shut down Tesla in the state. Authored and pushed by General Motors, HB1254 with amendment 3 would prohibit any manufacturer from being able to hold a dealer license after December 31, 2017. Existing law allows ANY manufacturer to apply for a dealer license without the use of independent franchised dealers. 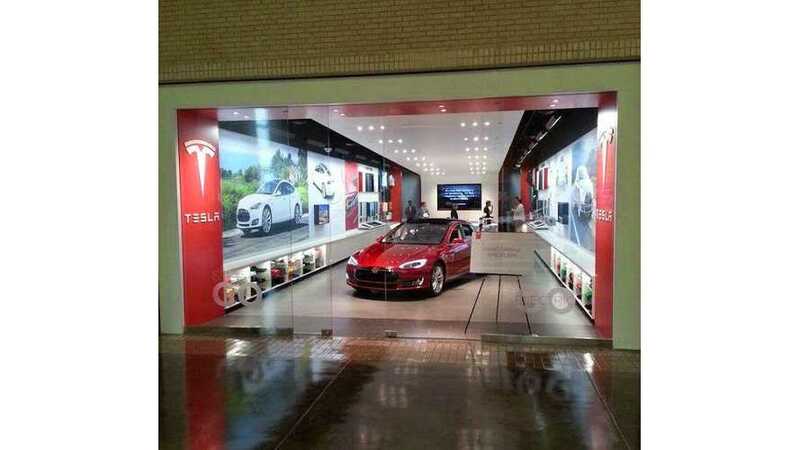 Despite having a lawfully granted license to sell Tesla vehicles directly since 2014 at the Fashion Mall at Keystone; despite contributing over $42 million to the state through the purchase of parts and components from Indiana suppliers; and despite plans underway to construct a 26,000 square foot Tesla Service facility that will employ approximately a dozen Indiana residents and serve our customers, GM is pushing the Senate Committee to shut out Tesla. Here's how you can help: please contact your local Senator – and if you live in one of the districts covered by any of the following Committee members, we urge you to reach out and let them know they should not shut out Tesla. You can find your Indiana legislators here. A follow up hearing will be held next Thursday, February 25, 2016, at the Capitol building. Let your voice be heard before that hearing to let them know that Indiana should encourage innovation, economic growth and consumer choice. Don't let GM tell you that your only option is to buy a car from a traditional franchised dealer by shutting out Tesla. Thank you for your support and willingness to help Tesla stay and grow in Indiana. As always, when communicating with legislators, please be polite and respectful. Personal attacks should be absolutely avoided as they will only hurt our cause! Thank you again. You can read the bill in its entirety at the source link below.